Percona Live Amsterdam discounted pricing ends July 26! The Percona Live Data Performance Conference in Amsterdam is just two months away and it’s going to be an incredible event. With a new expanded focus on MySQL, NoSQL, and Data in the Cloud, this conference will be jam-packed with talks from some of the industry’s leading experts from MongoDB, VMware, Oracle, MariaDB, Facebook, Booking.com, Pythian, Google, Rackspace, Yelp (and many more, including of course Percona). Early Bird pricing ends this Sunday (July 26)! So if you want to save €25, then you’d better register now. And for all of my readers, you can take an additional 10% off the entire registration price by using the promo code “10off” at checkout. It’s also important to book your room at the Mövenpick Hotel for a special rate – but hurry because that deal ends July 27 and the rooms are disappearing fast due to some other big events going on in Amsterdam that week. We’ve got a fantastic conference schedule on tap. Sessions, which will follow each morning’s keynote addresses, feature a variety of topics related to MySQL and NoSQL, High Availability, DevOps, Programming, Performance Optimization, Replication and Backup, MySQL in the Cloud, MySQL Case Studies, Security, and What’s New in MySQL and MongoDB. “MongoDB Patterns and Antipatterns for Dev and Ops,” Steffan Mejia, Principal Consulting Engineer, MongoDB, Inc. The conference’s evening events will be a perfect way to network, relax and have FUN while seeing the beautiful city of Amsterdam! Monday night, September 21, after the tutorial sessions conclude, attendees are invited to the Delirium Cafe located across the street from the conference venue. With more than 500 beers on tap and great food, this will be the perfect way to kick off the Conference. Tuesday night, September 22, Booking.com will be hosting the Community dinner of the year at their very own headquarters located in historic Rembrandt Square in the heart of the city. Hop on one of the sponsored canal boats that will pick you up right outside of the Mövenpick for your chance to see the city from the water on the way to the community dinner! You’ll be dropped off right next to Booking.com’s offices! Wednesday night, September 23, there will be a closing reception taking place at the Mövenpick for your last chance to visit with our exhibitors and to wrap up what promises to be an amazing conference! The post Percona Live Amsterdam discounted pricing ends July 26! appeared first on MySQL Performance Blog. The post Percona Live Europe 2015! Call for speakers; registration open appeared first on MySQL Performance Blog. It’s hard to believe that the Percona Live MySQL Conference and Expo is just over two months away (April 13-16 in Santa Clara, California). So if you’ve been thinking about submitting a proposal for the popular “Lightning Talks” and/or “Birds of a Feather” sessions, it’s time to get moving because the deadline to do so if February 13. Lightning Talks provide an opportunity for attendees to propose, explain, exhort, or rant on any MySQL-related topic for five minutes. Topics might include a new idea, successful project, cautionary story, quick tip, or demonstration. All submissions will be reviewed, and the top 10 will be selected to present during the one-hour Lightning Talks session on Wednesday (April 15) during the Community Networking Reception. Lighthearted, fun or otherwise entertaining submissions are highly welcome. Submit your proposal here. 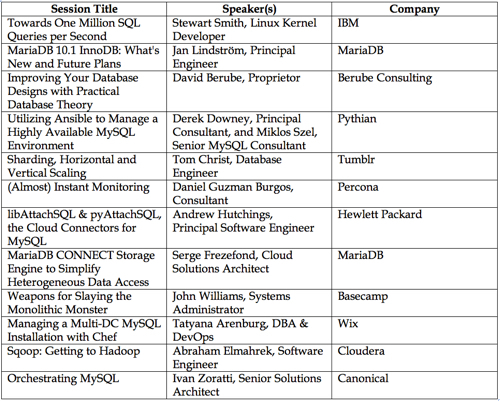 “MySQL 101″ is coming to Percona Live 2015. Birds of a Feather (BoF) sessions enable attendees with interests in the same project or topic to enjoy some quality face time. BoFs can be organized for individual projects or broader topics (e.g., best practices, open data, standards). Any attendee or conference speaker can propose and moderate an engaging BoF. Percona will post the selected topics and moderators online and provide a meeting space and time. The BoF sessions will be held Tuesday night, (April 14) from 6- 7 p.m. Submit your BoF proposal here. This year we’re also adding a new program for MySQL “newbies.” It’s called “MySQL 101,” and the motto of this special two-day program is: “You send us developers and admins, and we will send you back MySQL DBAs.” The two days of practical training will include everything they need to know to handle day-to-day MySQL DBA tasks. “MySQL 101,” which is not included in regular Percona Live registration, will cost $400. However, the first 101 tickets are just $101 if you use the promo code “101” during checkout. The great thing about Percona Live conferences is that there is something for everyone within the MySQL ecosystem – veterans and newcomers alike. And for the first time this year, that community expands to encompass OpenStack. Percona Live attendees can also attend OpenStack Live events. Those events run April 13-14, also at the Hyatt Regency Santa Clara and Santa Clara Convention Center. OpenStack Live 2015’s awesome sponsors include: PMC Sierra and Nimble Storage! With so much to offer this year, this is why there are several more options in terms of tickets. Click the image below for a detailed view of what access each ticket type provides. 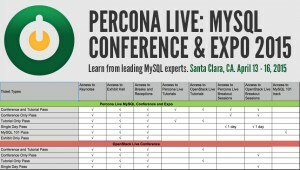 Register here for the Percona Live MySQL Conference and Expo. Register here for the OpenStack Live Conference and Expo. 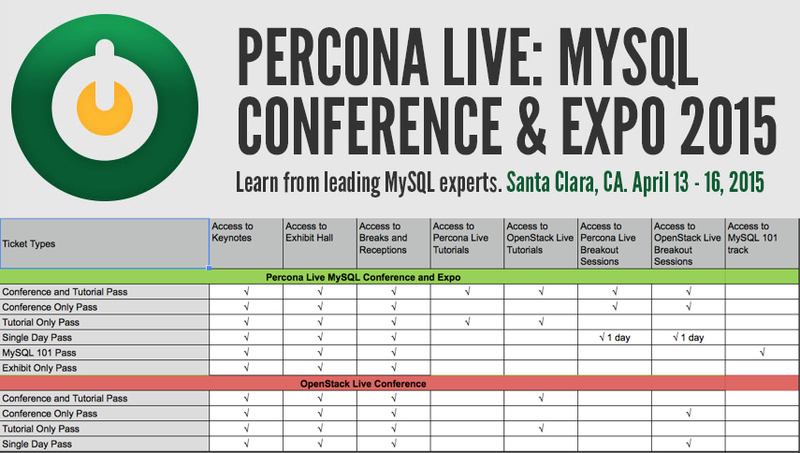 For full conference schedule details please visit the Percona Live MySQL Conference and Expo website and the OpenStack Live Conference Website! I hope to see you in Santa Clara in a couple months! The post Percona Live 2015 Lightning Talks, BoF submission deadline Feb. 13! And introducing “MySQL 101″ program appeared first on MySQL Performance Blog. On behalf of the OpenStack Live Conference Committee, I am excited to announce the sneak peek schedule for the inaugural OpenStack Live 2015 Conference! This new annual conference, running in parallel with the already established Percona Live MySQL Conference and Expo, will feature one day of tutorials followed by a full day of breakout sessions April 13-14, in Santa Clara, Calif. Though the entire conference schedule won’t be finalized until early January, this initial list of talks is sure to spark interest! So without further ado, here is he OpenStack Live 2015 SNEAK PEEK SCHEDULE! This is just a small taste of what will be presented at OpenStack Live 2015 conference this spring. Take advantage of this unique opportunity to hear from leading experts in the field about top cloud strategies, improving overall cloud performance, and operational best practices for managing and optimizing OpenStack and its MySQL database core. As a special bonus, OpenStack Live attendees attendees will also have access to the Percona Live MySQL Conference & Expo keynotes, receptions, exhibition hall, and Birds of a Feather sessions on April 13 and 14, allowing them to dive deeper into MySQL topics such as high availability, security, performance optimization, and much more. Registration for OpenStack Live 2015 is now open… register now with Early Bird pricing! Hope to see you there! The post OpenStack Live 2015: Sneak peak of the April conference appeared first on MySQL Performance Blog.